Note: Today’s challenge with the BLOGtober Fest from Arkansas Women Bloggers was to repost an old post. When I went through my archives, however, I found a few that were never finished or posted, mostly due to lack of time to do so. I found this very important post in that pile of unfinished projects, and I’ve decided to share it today. In fact, it’s timely in that Pulaski Tech is now working on their new facility and toward reaccreditation, adding certifications in Baking & Pastry as well as Wine Studies (the latter of which is through a different accrediting body). Pulaski Tech continues to have the only accredited culinary or hospitality program in Arkansas. Yes, it’s official. I’m certifiable. OK, yes, that way, too. But what I mean is, as a Certified Culinarian. As a student of Pulaski Technical College Arkansas Culinary School, upon graduation (and completion of a little paperwork) I may now use that title. Reason being, the school announced on Friday that the American Culinary Federation Education Foundation’s Accrediting Commission (ACFEF) and the Accreditation Commission for Programs in Hospitality Administration (ACPHA) has granted it their accreditation status. That gives us students some status in the marketplace, too. Don’t just take it from me; here’s the official flack from the school itself. LITTLE ROCK – The Pulaski Technical College Arkansas Culinary School today announced that it has received accreditation from the American Culinary Federation Education Foundation’s Accrediting Commission (ACFEF) and the Accreditation Commission for Programs in Hospitality Administration (ACPHA). Dr. Dan F. Bakke, college president, and Todd Gold, director of the PTC Arkansas Culinary School, made the announcement Friday during a news conference at Little Rock-South. Guest speaker Montine McNulty, executive director of the Arkansas Hospitality Association, commended the culinary school for the accomplishment. With this accreditation, the PTC Arkansas Culinary School joins the ranks of other nationally recognized culinary and hospitality schools, and thus offers students the opportunity to graduate with the title Certified Culinarian or Certified Hospitality Graduate. These certifications will allow graduates to enter the workforce with the most widely recognized culinary and hospitality credentials in the nation. The Pulaski Technical College Arkansas Culinary School is the only college in Arkansas to offer ACFEF accreditation for an Associate of Applied Science in culinary arts and is the only two-year college in the state to offer ACPHA accreditation for the Associate of Applied Science in hospitality management. ACPHA/ACFEF dual accreditation is offered at only 15 colleges and universities in the United States. Additionally, the PTC Arkansas Culinary School apprenticeship program has received American Culinary Federation recognition as the only culinary apprenticeship program in the state. Most importantly, these accreditations are widely recognized objective benchmarks in the culinary and hospitality professions. Pulaski Technical College Arkansas Culinary School graduates can expect to gain greatly enhanced employability based on their levels of skill and expertise as measured by these rigorous accrediting bodies. Pulaski Technical College is a comprehensive, two-year college that serves the educational needs of central Arkansas through more than 90 occupational/technical degree and certificate programs, a university-transfer curriculum and specialized programs for business and industry. The college’s mission is to provide access to high quality education that promotes student learning, to enable individuals to develop to their fullest potential and to support the economic development of the state. 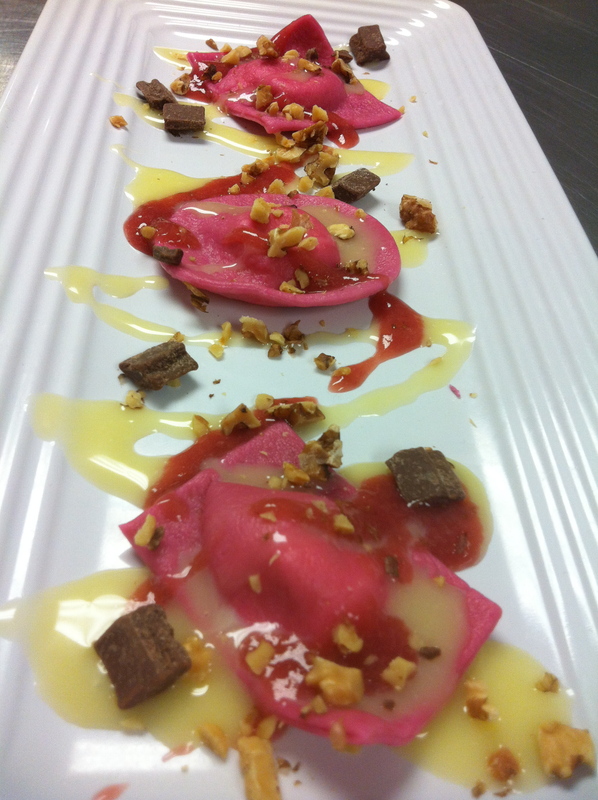 Our finished plate of pink pasta, with lemon cheese filling, strawberry and white chocolate sauces. 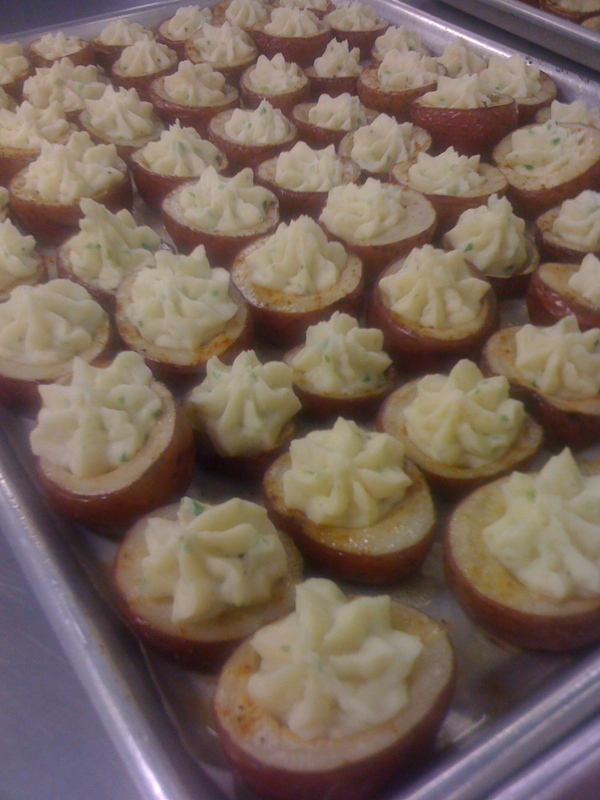 In Garde Manger class, we’ve been studying cheeses and making a few of them ourselves. Last week, our group made a fresh (meaning unaged) lemon cheese, and our homework assignment was to develop a dessert recipe to prepare the next week. We decided to make a dessert lasagna, using a strawberry puree (tomato sauce), chopped chocolate (ground beef) and the cheese. There was some fiddling around with gluten-free options for my sake, but the supplies for such things are low at the school. So we decided to go with phyllo dough, making it more of a napoleon. 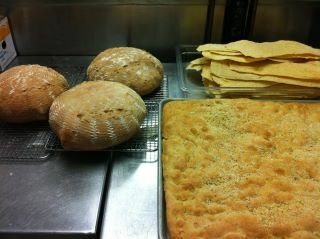 This week, the chef turned us loose to create our goodies. We made the napoleon, as pictured above. The sauce was particularly fun…I got creative (er, bossy) with my group and added balsamic vinegar and red wine to some strawberry puree and sugar, and cooked it down. De.LISH. No problem, actually. This class is fun because we get to play and make stuff up on the fly, even if the beginning is a prompt from the instructor. One of my group partners is quite adept at making pasta, so he whipped up a quick batch, adding some red food coloring as the instructor requested. We decide on making raviolis, filling them with the lemon cheese and dressing them with two sauces, the strawberry and a white chocolate sauce. While Pasta-Guy and I have done this, the other two students hadn’t, so much of the rest of their class was spent playing and filling. PG and I boiled the pasta and finished the sauces and the plate, which turned out pretty nice, considering its impromptu provenance. 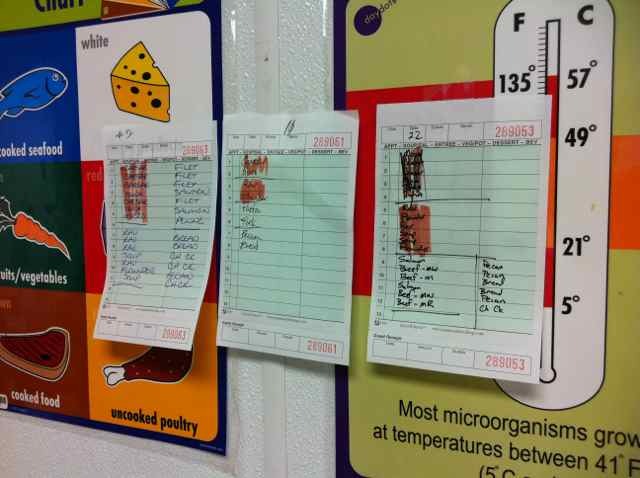 It was also a fanTAStic week in Food IV. And that is saying a lot. Things are looking up; I may know how to cook after all. More on that later. 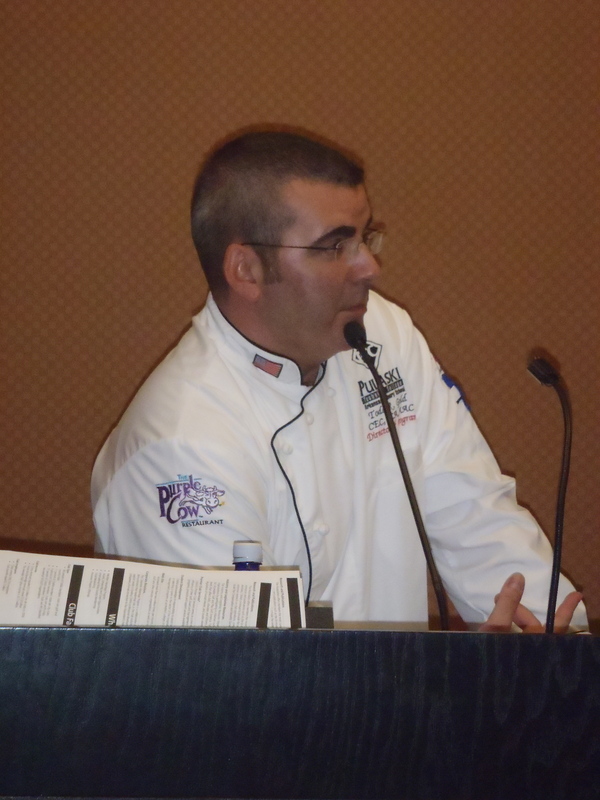 Chef Todd Gold, Director of Programs at Pulaski Technical College Arkansas Culinary School, answers questions after Monday's student orientation. 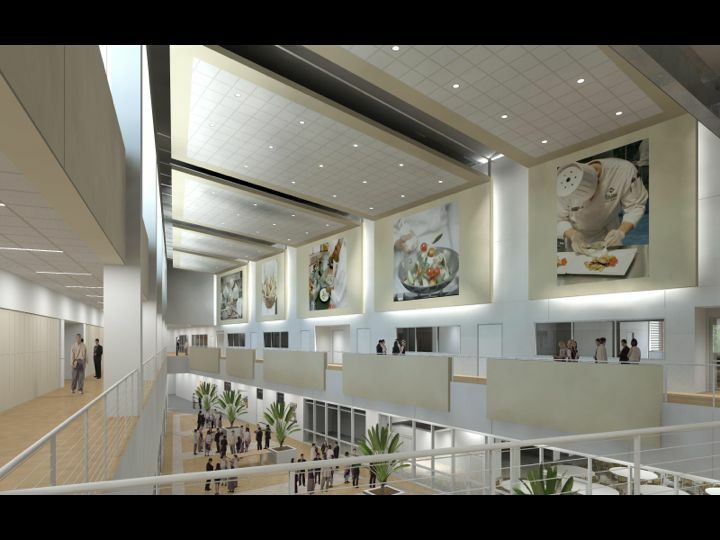 As part of the school’s stated vision to “make Arkansas a culinary destination,” Pulaski Technical College Arkansas Culinary School Director of Programs Todd Gold announced plans on Monday for a new, $12.5 – 15 million facility for the program, estimated to be completed in about two years. The program is currently at full capacity, with 350 students currently attending hands-on classes and about 150 taking general education classes, waiting for the culinary classes to become available. 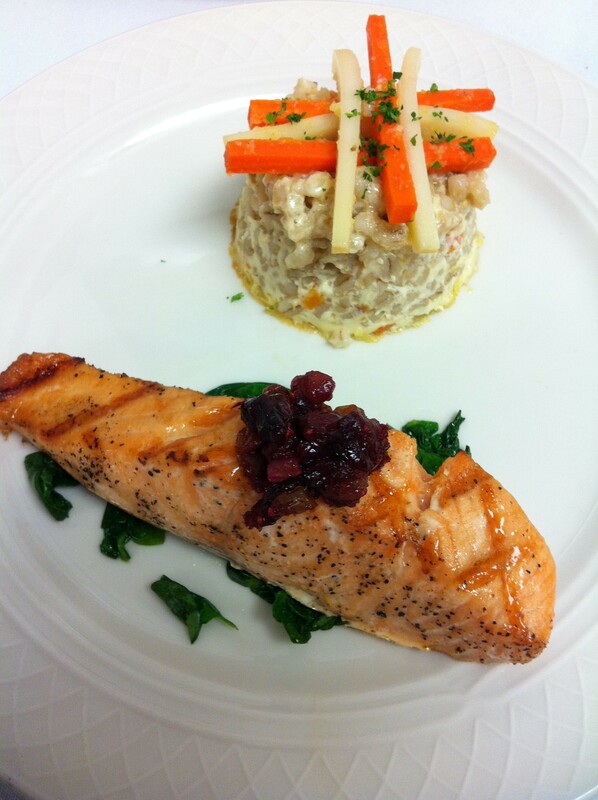 Culinary classes are currently taught at Pulaski Tech’s north and south campuses, although headquartered at the latter. Gold said the new facility will include teaching kitchens specifically designed for stocks, soups and sauces; baking; and meat and seafood (butchery). The meat and seafood kitchen will be held at 40 degrees, “like a huge walk-in [refrigerator],” Gold said, so carcasses may be safely held and broken down from a larger size. A new wine studies center will include stadium seating and special features at each seat to assist the learner in viewing and evaluating different types of wine. All details about the new facility are still considered preliminary, since the bond issue to pay for the project won’t happen until next month. But plans have been swift for months now, with the process to choose an architect currently underway. The new facility is planned to be about 40,000 square feet and two stories tall, and will be located on the north side of the parking lot for the current Pulaski Tech South building on Interstate 30, near Bryant. The school’s truck driving education program will be moved from this space to another location.